According to Peter Hantz, the main kürtőskalács preservationist, this is the earliest attested recipe for a layered rotisserie cake (a tree cake). 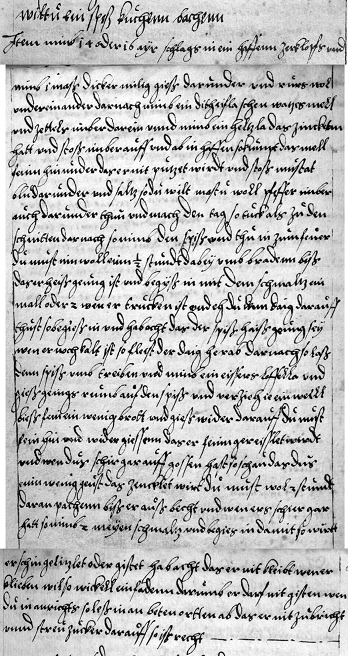 The source is a cookbook from 1582, authored by one Susanna Harsdörfer of Nuremberg. The title is Was zu 180 Zuckern Leckkuchleinn von Wirtz und Zucker genomen wirt, which means "How to make 180 sweet and tasty cakes with spice and sugar." It's quite a mouthful. Somehow it evaded the notice of Fritz Hahn, the most preëminent baumkuchen scholar—he wrote that the first tree cake recipe was published in a cookbook by Maria Sophia Schellhammer, a full 110 years after Frau Harsdörfer's. Anyway, her 1582 cookbook is here, and there's a recipe for a tree cake! 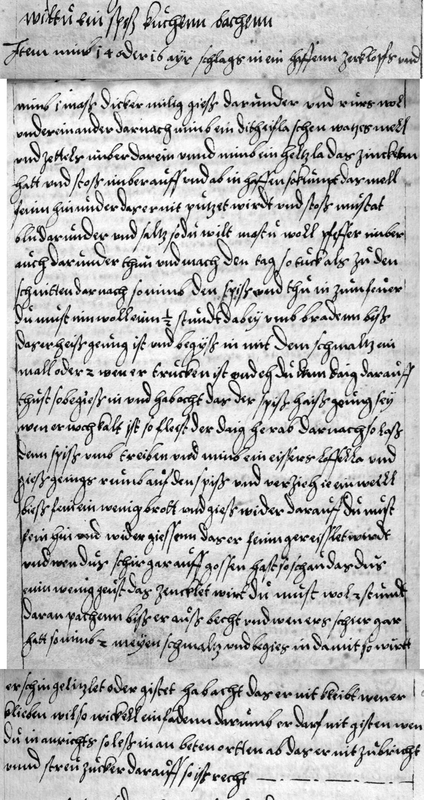 The whole book is handwritten in Kurrentschrift, a type of cursive, and the language is Early New High German. The translation was a joint effort between several members of the "Cooking Rumpolt" Yahoo! group. I wish to extend infinite gratitude to Katherine Barich (for translating the original, and for having a very informative blog) and Sharon Palmer (for providing her anachronistic culinary expertise). Beat 14-16 eggs in a pot. Add 1 maß [about 1.5 L] of thick milk [i.e. cream]. Next, take a scoop of wheat flour and add some ginger. Take a knobbed spit, crush ginger on it, then dust evenly with flour. In the pot add crushed mace and (if you wish) salt, pepper, and more ginger. Make the batter as thick as for milk toast [e.g. gulden schnitten]. Take the spit and put it next to the fire. Leave it there for half an hour, to ensure it is hot enough. Smear it with lard once or twice, being careful not to let the spit cool. To dribble the batter on, turn the spit and, with an iron spoon, pour the batter liberally onto the spit. Turn continually for a while, until there is a bit of a crust, then pour more batter on. Move the spoon carefully back and forth so the cake remains cylindrical. When the pot is almost empty, pour a bit more batter on the prongs, then bake the cake for 2 more hours until it is roasted through. When it has almost finished, baste with butter so it will be soft and succulent. Sprinkle sugar on it and serve.